First Line: Dinah Pelerin gazed out the window of a tiny, two-seater airplane as it lifted off from the airport in Darwin, Australia, and leapt into the hot blue sky. Dinah's Uncle Cleon is dying of cancer and has chosen assisted suicide out in the Australian bush instead of lingering to a painful end. As a result, he's called a gathering of the clan so good-byes can be said. When Dinah asks for leave, her boss throws a tantrum, so she quits her job and goes home to pack-- only to walk in on her boyfriend in flagrante with a redhead. What a wonderful, marvelous, stupendous start to such a sad occasion. When Dinah arrives, she finds a nest of relatives and friends seething in petty jealousies, suspicion, and all-around uncomfortable situations. Much speculation is being given to how Cleon is going to dispense his money, while very little attention seems to be getting paid to the murder of a man who was impaled on the back of a sea turtle on a nearby island. 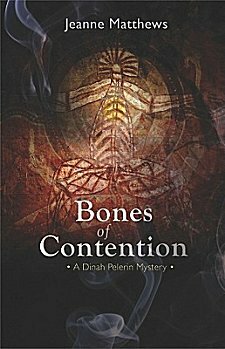 A wannabe anthropologist and passionate about mythology, Dinah is going to have to set aside trying to learn the ins and outs of her own family mythology in order to concentrate on two very strange murders. This book has such an interesting premise and takes place in a country about which I've always been fascinated. When I saw the added bonus of anthropology, I knew I had to read it. I did, with very mixed results. The Australian setting is well done, and although the cast of characters is a large one, I didn't find it difficult at all to keep track of each individual. Dinah has a refreshing sense of humor, too. The bones of this tome skeleton are good, but a few things went awry for me when the musculature was added. Enough emphasis was placed on the first murder of the man on the island to make readers believe that it had true importance. It didn't, and as a result the conclusion was a bit anti-climactic. Dinah's sense of humor wasn't enough to disguise the fact that she can be silly and childlike, and has altogether too much baggage for one character. Speaking of characters, they were well-drawn because I was never confused in following each member of this large cast. However, I rapidly lost interest in them. A large percentage of them were extremely unlikable, and the ones who weren't didn't figure into the story enough to outweigh the poison of the others. I don't mind reading stories about unlikable characters, but it's a hard slog when my interest wanes and I begin to wish that they'd all admit to being the guilty party. All in all this book has an interesting premise, a wonderful setting, and a good sense of humor that I felt were let down by the story and characters. Here be talent, though, and I would be interested to see how this series develops. Cathy - It's the setting and atmosphere that really get my attention for this one. And for me, that matters. Yes, setting and atmosphere matter to me as well. is books. I actually have books on my bathroom window sill. should just open up a library -- that will solve the problem. It's just the overflow that's stressful. I sit at my computer looking at my huge bookshelf, filled with books; many belonged to family members or old friends or were gifts or I acquired over the years. I treasure the books that belonged to others or were gifts. Or that belonged to the years in which I read a lot of history or contemporary world events. However, they all fit on the shelves in two rooms. Now, hoever, with my acquisitions of mysteries, which come in from many directions, they have flowed over and are all over the foyer, bedroom and even going into the bathroom. I have to strategize to figure out how to make the book stashes more manageable. I had to do that, too, Kathy.